Pumpkin Cake Mix Cookies: Just 2 Ingredients. Really! Pumpkin Cake Mix Cookies: this is the ultimate easy cake mix cookies recipe. Yes, it’s possible to make homemade cookies with just 2 (yes, two!) ingredients! 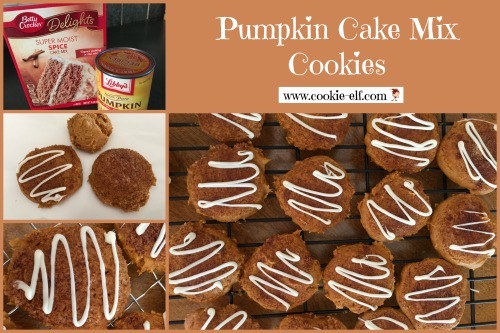 Flavorings in the spice cake mix combined with canned pumpkin give these drop cookies the taste of pumpkin pie in a soft, cakey cookie. Mix them, drop them, and bake them as rounded – or take two additional steps to make them look even better: 1. Make flattened cookies rather than rounded cookies. Flattened cookies bake more evenly and take just one additional step. 2. Glaze the cookies. It’s easy to do and it sure looks pretty. But however you decide these cookies should look, they are awesome. Preheat oven to 350º F. Line baking sheets with parchment paper. Set them aside. Place cake mix and pumpkin in a medium mixing bowl. Use a large spoon to combine the ingredients by hand, scraping the bowl regularly. Mix until the cake mix has been absorbed. The cookie dough will be thick and sticky. Use a cookie scoop, teaspoon, or ice cream scoop to form the dough into round, scant 1-inch balls. Place cookies on ungreased baking sheets 2 inches apart. Optional: for flat rather than mounded cookies, combine granulated sugar and cinnamon in a small bowl. Dip the bottom of a drinking glass into the cinnamon-sugar mixture, and then press each cookie surface lightly. Repeat for each cookie. Bake cookies for 9-10 minutes, one baking sheet at a time, until cookies are set. Remove cookie sheets from the oven. Allow cookies to sit for 1 minute before using a spatula to transfer them to a wire rack. Cool completely. Optional: to glaze cookies, first melt the candy coating or baking bar. Place it in a Ziploc sandwich bag and microwave it for 10-20 seconds. Remove the bag and massage it to make sure glaze has melted. Work glaze down to one corner of the bag. With a scissors, cut ¼ inch off the corner of the bag. Pipe glaze over cookies in a diagonal pattern. The glaze will set in a few minutes. You can use any brand of cake mix to make the cookies. You can combine cookie ingredients with an electric mixer on medium speed rather than with a large spoon but to be honest, mixing them by hand will take only 30 seconds. If you make rounded cookies, add 1-2 minutes of baking time. Get more easy recipes on our Cake Mix Cookies Recipe Pinterest board.